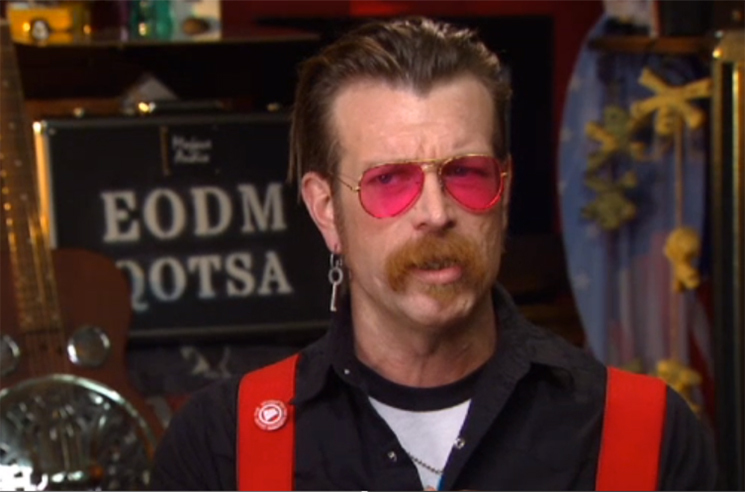 Four months on from the tragic terrorist attacks in Paris, Eagles of Death Metal frontman Jesse Hughes has been opening up about what he and his bandmates witnessed during their horrific tour stop. In an interview with FOX Business Network, Hughes now alleges the Bataclan venue's security team may have been in on the attack. "Right before we walked onstage, there were two dudes in shorts and trench coats, they were standing, without talking, heads down in the corner, by where the entrance out into the venue is from backstage," Hughes said. "We have a joke, that if you're not smiling at one of our shows, you surely can't be there to see the Eagles of Death Metal, because you don't know what you're in for. [Sound engineer] Shawn [London] looked at me and said, 'They certainly don't look like they're here for one of our shows.'" He continued: "When I first got to the venue and walked in, I walked past the dude who was supposed to be the security guard for the backstage. He didn't even look at me. I immediately went to the promoter and said, 'Who's that guy? I want to put another dude on,' and he goes, 'Well some of the other guards aren't here yet,' and eventually I found out that six or so wouldn't show up at all." When asked why that was, Hughes didn't make a definitive statement "out of respect for the police still investigating," but did say "it seems rather obvious they had a reason not to show up." The first part of the interview aired last night (March 9), while the second will air this evening. Watch a clip from the interview below. Eagles of Death Metal played the Bataclan in Paris on November 13 when 89 concertgoers were killed in the terrorist attack.